OMG I’m mortified!!! I meant to sign “All the best,” NOT “all my love!” Please disregard that! His embarrassment was palpable; enough to make anyone cringe. Remarkably, moments like this happen often within the academic environment. I also once had a student in my class whose laptop was inside his backpack when it started to make noise. Rather than calmly removing the laptop to turn off the noise, the student instead proceeded to stand up, grab his backpack, feverishly open the classroom door, and toss the backpack outside as if he never wanted to see the wretched thing again. He coolly sat back down in his seat as if nothing had happened. Awkward…. 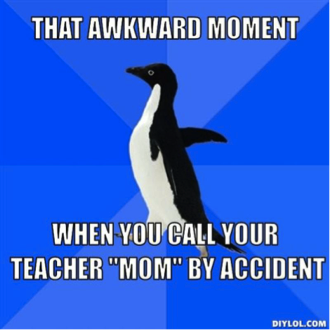 Unfortunately, social blunders can impact students in negative ways, especially shy students. In fact, research indicates that socially anxious people are more likely to overestimate the negative outcome of awkward moments. Put simply, some people may become consumed with feelings of embarrassment (Moscovitch, Rodebaugh, & Hesch, 2011) and this may pose implications for the classroom climate. Though awkwardness is an understudied topic, instructors can examine what causes feelings of embarrassment and awkwardness by drawing upon Goffman’s (1967) concept of the “face.” Goffman claims that one’s face represents a person’s social identity. It is the observable version of a person we see in her or his actions. One can imagine that these awkward situations may have the strong potential to be face-threatening. In fact, the common phrase “saving face” refers to the idea of helping or making someone appear positively in the eyes of others to reduce face-threatening outcomes. It takes no stretch of the imagination to see how the concept of saving someone’s face can be related to helping someone navigate a potentially awkward situation. Haha thanks for being cool about it! No matter how much preparation and training teachers receive, we can never be fully prepared for the numerous awkward moments which will surface throughout our careers. However, it is important for instructors to help manage their student’s sense of face to help them to negotiate a positive social identity. Through appropriately applying politeness strategies to best accommodate a particular awkward context, students may be able to move past the social blunder more smoothly. Brown, P., & Levinson, S. C. (1987). Politeness: Some universals in language usage. New York: Cambridge University Press. Chapter 22 – “Politeness: Some Universals in Language Use” available at http://www.scribd.com/doc/53659180/Politeness-Some-Universals-in-Language-Usage-1. Moscovitch, D. A., Rodebaugh, T. L., & Hesch, B. D. (2012). 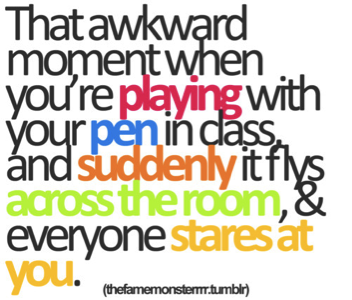 “How awkward! Social anxiety and the perceived consequences of social blunders.” Behaviour research and therapy, 50(2), 142-149. http://www.ncbi.nlm.nih.gov/pmc/articles/PMC3260374/. Goffman, E. (2005). Interaction ritual: Essays in face to face behavior. Aldine Transaction. Publisher’s information page: http://www.transactionpub.com/title/Interaction-Ritual-978-0-202-30777-0.html. Goldsmith, D. J. (2008). “Politeness theory: How we use language to save face.” In L. A. Baxter & D. O. Braithwaite (Eds. ), Engaging theories in interpersonal communication: Multiple perspectives (pp. 255-267). Los Angeles, CA: Sage. Publisher’s information page: http://knowledge.sagepub.com/view/engaging-theories-in-interpersonal-communication/SAGE.xml. In situations like the one you describe, I like to use what I think of as “social jujitsu”…capitalizing on the person’s forward motion in the situation and redirecting it. In the situation you describe, I’d likely respond to the student’s second email with something like, “No worries! I’ll take all the love I can get : )” or “S’alright…as John and Paul remind us, all you need is love : )” (punnier at a Jesuit institution than at a public one, perhaps) or “I’ll take all the love I can get…and I’ll take your best, too : )” Rather than acknowledging the situation as awkward and then trying to put a positive face on it as in the Positive Face Redress approach, my intention is to reframe the situation as less awkward than the student might imagine in the first place. The awkwardness of the situation largely lives in the student’s perception that the instructor will view his gaff as with a negative connotation…that the student did something “bad.” To me, the Positive Face Redress still starts out will some version of “Yeah, you screwed up….” even if it finishes with some version of “…but that’s okay.” I’d prefer not to say something that confirms the student’s perception that I think he screwed up or did something bad. Though there’s a case to be made that I’m merely applying the Positive Face Redress approach with tacit, rather than explicit, acknowledgement of the awkwardness of the situation, I think of my approach as responding in a way that attempts to bypass the awkwardness and, instead, present the situation as providing positive unintended consequences. Love [sic] how you make the point here about bringing the “unawkwardness” to the surface with a reply that may seem, out of context, tacit, but shines as humbly – even respectfully – explicit in the very specific context. Thanks for this.